Kansas Farmer Mark Nelson says he's too busy with harvest to think much about abstracts, but he admits that the prospect of depending on fewer and fewer, larger and larger companies for his seed, fertilizer and chemicals is "a little nerve wracking." 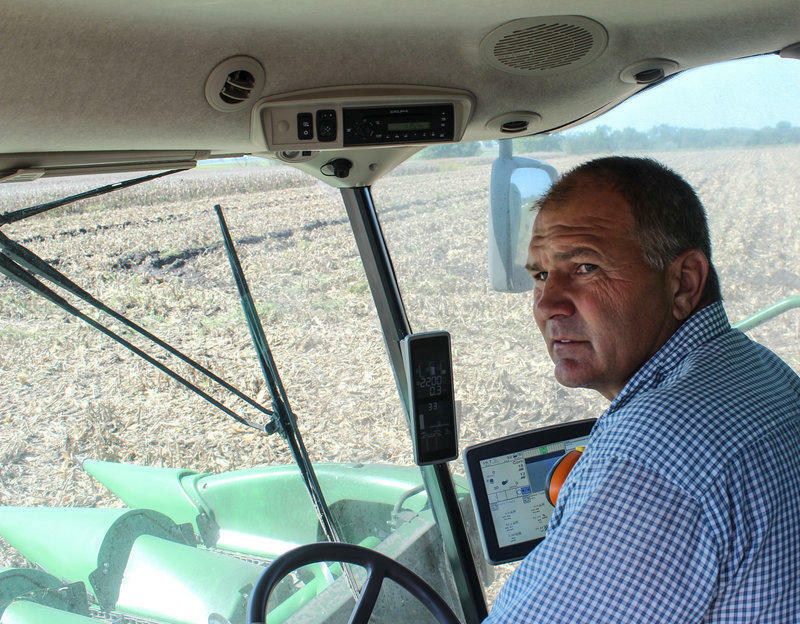 Like most farmers, Mark Nelson, who grows corn, soybeans and wheat near Louisburg, Kan., is getting squeezed. He's paying three times more for seed than he used to, while his corn sells for less than half what it brought four years ago. "It's a – that's a challenge," Nelson says. "You're not going to be in the black, let's put it that way." Low commodity prices are rippling up and down the farm-economy food chain — from the farm to the boardroom — and it has many of the huge companies that control farm inputs looking to a new future. Most of the seeds and chemicals used to grow the world's crops come from just a handful of big companies, and the largest of those multinational companies — Monsanto, Bayer, Dow, DuPont, and Syngenta — are trying to get even bigger. The prospect of fewer, larger companies controlling so much of the basic food supply is giving some farmers and antitrust advocates heartburn. With massive supplies of the world's most important crops, like corn and soybeans, prices have plummeted. Seed industry consultant Bud Hughes says that doesn't just affect farmers. The massive companies that supply farmers are hurting, too. "To be cost effective, they've got to look for cost synergies, they've got to look to become a lower-cost provider, and find efficiencies in their research engines, find efficiencies in their cost of goods, etcetera," Hughes says. And to do that, agri-giants are pairing up like teenagers at a dance. German company Bayer is trying to merge with Monsanto, the world's dominant GMO seed company. Bayer is known for its aspirin, of course, but it's also a leading pesticide company and holds some very successful genetic seed-trait patents. Dow is trying to hook up with DuPont; both companies have enormous agricultural divisions. Then there's ChemChina, which is trying to buy Swiss biotech giant Syngenta. The burst of mergers is making some people in farm country nervous. "It's scary," says Clyde Sylvester, owner of Sylvester Ranch Seeds, near Ottawa, Kan. "It's not good for the farmer." Corn and soybean fields surround Sylvester's business. It seems a long way from the corporate headquarters of firms like Bayer or Syngenta. "This is a family operation," Sylvester says, standing near the farmhouse at the center of his operation. "My dad started the operation in 1945, been selling seed ever since then." Back then, many farmers dabbled in the seed business. Public land grant universities did most of the research and shared it freely. Now, Sylvester, like many of the other 100 or so other mid-sized farm seed companies, license technology and seed traits from the big companies to use in his own branded corn and soybean seeds. Today, the companies he works with compete against each other. After the mergers, at least two of them may not. "Lack of competition," bemoans Sylvester. "When you look at it, the world's food supply is going to be controlled by what – three companies?" The proposed biotech mergers are setting off alarms in Washington, too. Iowa Sen. Chuck Grassley called a hearing on Capitol Hill to discuss the mergers. "I'm afraid that this consolidation wave may have become a tsunami," Grassley said. At the hearing, company executives defended the mergers. Monsanto's Robb Fraley, chief technology officer, testified that biotech companies are racing to keep ahead of climate change, pesticide-resistant weeds and the population explosion. To do that, he says they need to spend big on science. "Because the solutions we need can only come if companies can embrace new technology, if they can increase their investments and accelerate R & D. And that's why you are seeing this latest round of investments across our industry," said Farley. But, Diana Moss, president of the American Antitrust Institute, says the mergers are motivated more by the quest for profit. "The proposed mergers could well increase prices for biotechnology, eliminate choices for growers, slow down innovation and raise food prices to consumers," Moss testified. Moss says she opposes a system where three companies control four out of every five corn seeds sold in the world. "This isn't only happening in agriculture or biotech — it's happening in many other sectors," Moss warns. "We have sort of an epidemic of declining competition in the U.S. and internationally. We have major sectors dominated by just a handful of firms." Look at telecommunications, she says, health insurance, or even grocery stores. Regulators will likely force merging agricultural companies to sell off parts of their businesses. That could create openings for competitors, which in theory could lead to the next generation of biotech companies. But for the near term, it seems likely that an industry tasked with feeding more and more people will be controlled by fewer and fewer companies.